DRAPED IN RED SATIN AND ACCOMPANIED BY JET ENGINE ROARS, A DOUBLE BILL FEATURING FANTASTIC YOUNG MUSICIANS CHARMED THE RED RATTLER IN SYDNEY’S MARRICKVILLE LAST MONTH. WITH PETER FARRAR DEMONSTRATING SAXOPHONE IMPROVISATION AND ALANA BLACKBURN OFFERING A VERY FINE INTERPRETATION OF CONTEMPORARY CLASSICAL MUSIC FOR RECORDER, NEW MUSIC NETWORK HAS ONCE AGAIN SUCCESSFULLY SHOWCASED INNOVATIVE MUSIC IN SYDNEY’S INNER WEST. Farrar’s experimental alto saxophone set opened. He chose the floor in front of the stage rather than an elevated position for an exercise in sonic safari. His unassuming stance ensured we would meet him in his place of improvisation. 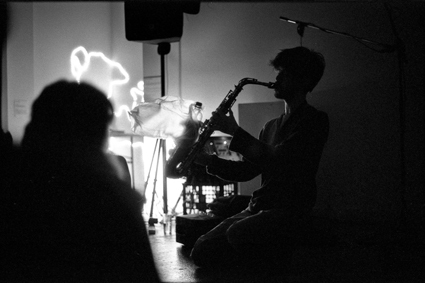 Farrar popped a plastic water bottle in the bell of his sax and, presumably drawing on his experience in African scales practised with Ethiopian singer Dereb the Ambassador, sped into crowded marketplaces of sonic invention. He crossed genres and national borders. At times his notey flights could have come from bagpipes. Gasping for air after busy phrases he conveyed just how much information he was processing live for us. Then an abrupt stop. He casually sipped water from another plastic bottle and let silence annunciate just how much energy he had built with the vibrations and buzzing of his modified instrument. Farrar’s second offering was a sound world in four breaths, or four movements. Each breath was longer than your average exhalation due to impressive cheek-puffed circular breathing. The bell of his horn now stuffed with water bottle and a loose plastic bag, the resultant sounds hissed like an old pinball machine. Multiphonics honked in and out as in a seismologist’s dream. His study in sound allowed time to move at its own speed, which felt both dilated and compressed. Later when Farrar returned to a traditional sound, sans bag and bottle, the timbre of the instrument was so comparatively clean as to feel almost inadequate. He dextrously made up for this tonal simplicity with rapid arpeggiated passages. Then like a singer producing the same pitch using different vowels, Farrar pulsed on long notes bringing out subtleties in harmonics and overtones. This reaffirmed what seemed the message of his entire set, that we can expect more from a saxophone. When Farrar abruptly announced in a shy voice, “That’s the end of the set. Please get up and do stuff,” there was electricity in the air and a sense throughout the room that we could have lapped up more of his humble genius. Thankfully Alana Blackburn stepped in to fill that spot. 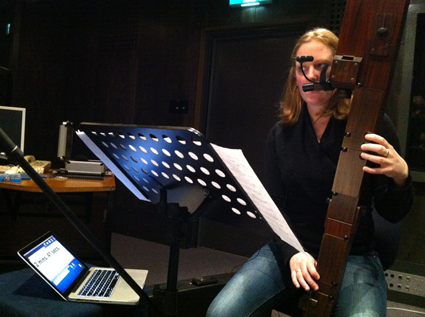 Blackburn is an expert in Renaissance, Baroque, Contemporary and Japanese repertoire for recorder. Her program featured two Japanese-inspired compositions, Kage (2000) by Dutch composer Roderick de Man and Et Døgn (2009) by Steve Adam. Norwegian for ‘one day,’ Et Døgn, for four different-sized recorders and computer, explored sounds mimicking nature including chirping birds and crickets. Enchanted Japanese forest meets late-night radio. Perhaps this music was too subtle as it left me asking, “Why do this live when it could be synthesised?” While Blackburn gave an excellent performance, there was a sense that the concept might be better honed to perfection in a studio, as the spontaneity of live performance didn’t seem a defining feature of the sound world. Kage (2000), after the Japanese word for shadow or reflection, was a study in interaction between fixed media and improvisation. Blackburn imitated the electronics and at other times her scored part took the fore. Some of the accompanying material derived from recordings of Noh theatre including vocal exclamations and shakuhachi sounds. The Japanese elements of this work came across well, even with a pronounced Dutch accent. All works in Blackburn’s set had been written since 2000, including a world premiere of a work by Anthony Leigh Dunstan. His piece, Tic, communicated musically the nervousness a performer feels. Dunstan’s aim had been to subvert the relationship between stimulus and gesture in the music-making process. He says a shy, nervous character is integral to the expression of this musical material because it prescribes the physical gestures that will then be transformed into musical phrases by the performer. Blackburn’s realisation of the nervous tic was highly involved and bordered on mania rather than self-consciousness. Her commitment to theatrics was impressive however and carried the weakest composition in the program through to hearty applause. _derivations by local Ben Carey was perhaps the most progressive and refined work in the program. Sound technologist Carey was present to manipulate synthetic and live samples. Ever expanding a database of musical materials, a form of timbral matching was employed to build a conversation between musician and computer in true concord. Top job, new musos!